I took almost all of Wednesday off. I slept late and enjoyed it. I went to the lake after work for a very quick swim. Only Robin and Darian were there. Darian was with his family. I had a relaxing swim out to the third buoy for an easy 500 yards or so – nothing major. The lake was empty and the temperature of the water and air was a bit cooler. I got these elevation numbers from the RC Triathlon and Adventure Blog. Robin did Lake Placid last year and John has done Switzerland, Brazil, South Africa and New Zealand. Louisville is 5th on the list and 2nd for North America. Talking with Robin and John, neither of them thought that any of the ironman’s that they have done were ‘that’ hilly. But, they are, ironmen after all. From our 78 mile ride last weekend my gps read a total elevation gain of 5,789 – from garmin-connect. Doing the math - 78 miles is 70% of an ironman and 70% of 7578 feet is 5304 feet. It would appear that our rolling hills of South Mississippi are comparable to the Louisville course. 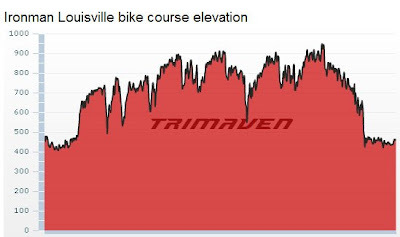 One big proviso – as we can see from the chart below (captured from trimaven – the first 10 and the last 25 miles are either flat or down hill. That would put the all of the elevation gain in the middle 78 miles or so. I guess the rolling hills will be bigger. To clarify about the pop tarts and trashy food in the previous post. That was what I ate during the exercise session. I ate much better post ride – streamed veggies, lean protein, etc. The pop tarts have just become an easy, cheap portable food source. After seeing the elevation stuff for Lake Placid... what was thinking about signing up on Monday for next year? Guess that will just mean some good hill training on some humungous hills for next year! Total elevation is deceiving as I don't think it's an indication of how hard a course is. I rode LP and WI a week apart and WI was so much harder, even though LP has more elevation. LP's climbs are longer and more gradual, and just fewer in general where WI was constant and unrelenting. My legs were fried. But I'm starting to really enjoy the hills, thankfully! Somehow I think MS will never quite be enough for proper hill training! Glad you cleared up the pop tart issue! Have fun this weekend! !